On the evening of Friday, February 1, 2019, one of our basketball officials from the Hammond Basketball Officials Association was accosted by a fan in the parking lot after a varsity basketball game at Jewel Sumner High School. While there was a reserve, uniformed officer present who attempted to intervene, our official was struck in the chest by a punch thrown by this individual. As of the time of this communication the assailant has not been apprehended but we believe a positive identification will be made and action will be taken. It is also our understanding that the official involved will press charges against the attacker. While we do not have every detail of this event and there is clearly more to develop we believe that making all of our high school officials aware of this unfortunate incident is important. We further believe that this is a stark reminder of the importance of continued vigilance as you travel to, arrive at, officiate, and depart all contests you officiate. 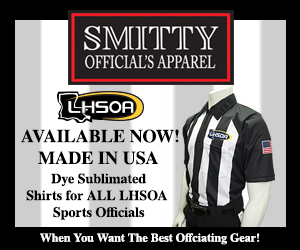 The LHSOA is hopeful that a proposal just passed at the LHSAA Annual Convention will enhance the level of security at all varsity contests you officiate, in all sports. We will strive to keep you informed of any updates associated with this incident. Finally, we strongly encourage all of our officials to report any incidents involving coaches, players or fans where inappropriate action is directed towards you or your crew members. We believe the most appropriate response is to put all the facts of the incident in writing and share it with your local assignor as well as Lee Sanders, Director of Officials at the LHSAA. Only by following through and getting these situations on the record can we hope to have any opportunity to hold the responsible parties accountable. Be vigilant, be safe. ← Previous Story Confirmed Keynote Speaker for the 2nd Annual LHSOA Summit is Alan Goldberger.